When this class began and I started to imagine a digital project that I could create, I wanted to connect the project to research I have done on the 1926 Public Assemblages Act in Virginia. I decided to devote my project to the history of race relations in Virginia from emancipation in 1863 to the Brown v. Board of Education decision in 1954. The larger topic of Virginia’s role in white supremacy and black activism came from a realization that most Virginians do not understand their history and are unaware of the heroic acts of protest, some decades before the national Civil Rights Movement gained momentum, or the extremist views that once existed in the state. I felt that I could present a history with information that few people knew about. Virginia is often overlooked as a center for rich study of the struggle for black equality because it lacks the violence of the states in the Deep South. Furthermore, I chose 1863 to 1954 because it is often mistakenly presented as a rather static period of history with little activism from the black community and uniform efforts on the part of whites to establish oppressive laws. In fact, there are many instances of black activism and white communities often presented varied opinions on the best way to manage race relations. The goal of “Jim Crow Lived Here” is to bring about awareness and provide quality scholarship of some of the lesser-known instances of white supremacy, Jim Crow laws and black activism within Virginia’s post-Emancipation history. Additionally, I hope to make it clear that these events occurred in relation to one another, not isolation. I want to appeal to two major audiences, history buffs, and students. In order to appeal to these groups, the website had to be scholarly yet visually appealing and accessible to non-historians. Before completely committing to the goal of the project, I made sure that no one else had completed an identical project. There is currently no project that focuses on Virginia that begins at Emancipation and ends at the Brown v. Board decision. The Virginia Historical Society’s Civil Rights Movement in Virginia digital exhibit was created to accompany a physical exhibit of the same title in 2004 at the organization’s Richmond, Virginia location. The online exhibit’s sixteen pages provide a quick overview of Virginia’s Jim Crow laws and civil rights achievements from 1866 to the 1970s. While Civil Rights Movement in Virginia depicts a handful of events and sets them against a wider national context, the goal of “Jim Crow Lives Here” is to provide more in-depth information about events and legislation. The Virginia Foundation for the Humanities’ Encyclopedia of Virginia contains hundreds of entries with detailed information about events, people, and places of Virginia’s past. Because it is set up like an online encyclopedia and feels similar to Wikipedia, there is little contextualization within the commonwealth’s or national history. “Jim Crow Lives Here” will overcome the weaknesses of Encyclopedia of Virginia because it will integrate the people, places, and events in a thematic and chronological organization. The next step of the project was to identify the content I wanted to include and determine the best tool or platform to work with. I knew I wanted to include primary sources like photographs and newspapers. The best tool to display these along with text was Omeka, which allows web-builders to create items complete with metadata that identifies source, author, date, publication, and format information. Multiple items can be accompanied by long-form text in the form of exhibits. I imagined each event of segregation or activism to be its own exhibit accompanied with supporting items. Visitors to the site can read about the event and click on individual items and understand the item’s original source. I felt Omeka was a better choice than WordPress because it allows for more dynamic item information rather than just embedded pictures with a lot of captions. I spent a lot of time previewing existing Omeka sites to get ideas for what I wanted my website to look like. My favorite was the Histories of the National Mall site. The Mall Histories Theme lends itself to the goals of my project and helps me to ensure that both audiences are comfortable and interested in browsing through the site. The home page of the website is very visual and lacks lengthy text. I firmly believe that home pages with a large amount of text are intimidating to many people and less inviting to those who might want to browse. Despite a learning curve, I was able to customize the theme in ways that made sense for my project. It took some playing around before I figured out how to make the navigation buttons go where I wanted them to go. 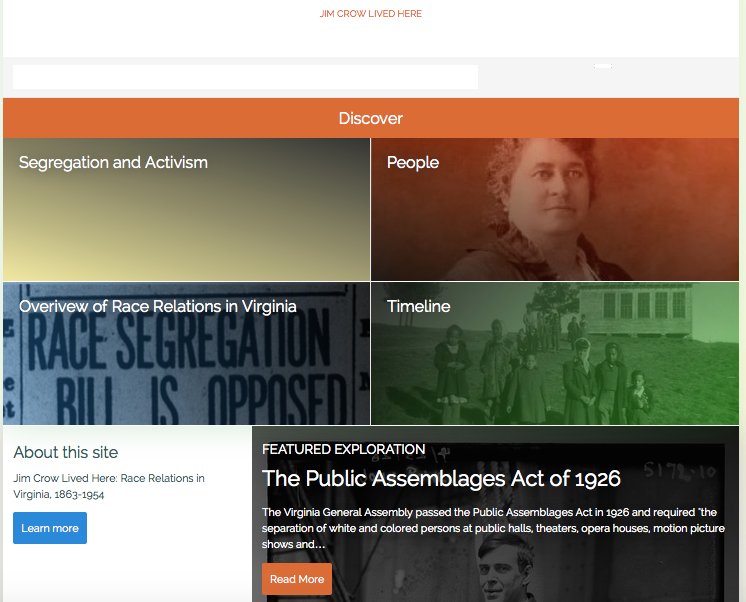 The home page is laid out so that users can navigate to acts of segregation and activism, people central to the story of Virginia’s race relations, a scholarly overview essay putting the events in context, or a timeline of events to visually place the events. The photos behind the large navigation buttons depict primary sources related to the topic of the site. These titles also appear across the heading of every page of the site. I did have to create new navigation pages to make the theme work for my website. I really wanted four main navigation categories- People, Events of Segregation and Activism, a Timeline, and a scholarly Overview. The “browse exhibits” button is the only one I kept from the original theme. It is re-titled “Segregation and Activism.” The “Overview of Race Relations” and “Timeline” pages are simple pages that I used instead of the mall history’s “browse items” and “about” pages. Lastly, with the help of Dr. Leon, I created a custom navigation button for “people” that is set up to display only the people item types. This was much better than my original plan to re-title “browse collections” as people and have only a people collection for the entire site. The end result of the custom people navigation is a list of people significant to the history of race relations. Users can view a picture and see a small blurb about them before clicking into the extended content. Additionally, because I chose to work with the Mall Histories theme, which wasn’t intended for general use, I had to change around some of the code in the HTML folders in my cPanel. This was totally new to me. I have never worked very much with HTML and in many cases my plan of attack was really just scrolling through the code in the various files trying to find what I needed. One thing I had to figure out how to change was the navigation link that automatically appeared in each exhibit that said, “Go back to all questions about the National Mall.” Fortunately I figured out that in the code editor for the exhibits php file, I could rewrite the link to say, “Go back to Segregation and Activism.” I also had to delete the Center for History and New Media and the National Endowment for the Humanities logos that appeared the footer. This was pretty simple and I was able to replace it with a “proudly powered by Omeka” statement and the Creative Commons licensing information. Outside of Omeka, I also used TimelineJS to create a visual timeline of the important events in Virginia’s racial history. The timeline includes fifteen events accompanied by a picture and a description. Many of the timeline events link to items or exhibits within my website. I felt that the ability to link to pages in my site was really important to allow visitors maximum usability. This ensures that visitors don’t have to browse the website in a particular order to access the information. My original timeline did not link correctly. Fortunately, once I started over, the second version linked to the pages with no issue. There were several decisions I made about the content to try and ensure that my intended audiences would actually enjoy the site. Each exhibit begins with an overview description at the top of the page before continuing in greater detail. This design choice should, hopefully, appeal to casual visitors looking for a quick answer. To appeal to historians or students, I really wanted to provide extended research that was not already on the Internet. Much of what I included in the exhibits comes from academic press books or scholarly articles that are not open access. I also wanted to boost the credibility of my research by including footnotes and a bibliography in each exhibit. The footnoting process took much more time to complete than I expected because I had to hand-code the HTML to create the footnotes. For some reason, I could not get the footnotes to link to the bottom of the page and back to the text. I tried a few different variations of the HTML code but none worked. In the constraints of time, I decided that as long as the footnote appeared, that was the most important thing! I made the choice to post individual bibliographies for each exhibit so the viewer would have a clear idea where they could find more information on the topic. The lists include open-access websites, scholarly journals, and books. The addition of open-access websites ensures that both the history buff and the history student will be able to use the bibliography for their unique purposes. The hardest goal to reach in terms of the content was putting these events in context. I wanted it to be clear to viewers that these Jim Crow laws or events of activism in Virginia did not occur in isolation. I wanted to provide both a national and state context. The scholarly overview essay that I included as one of the main navigation links will help to accomplish this goal. The overview essay provides a general chronology of the exhibits I included under “segregation and activism” and provides current historiographic information about the topic to add value for the scholars and students who might visit the site. Currently, Jim Crow Lived Here has four exhibits that include detailed, scholarly research. I would have liked to include more. My original goal was ten. However, I realized that the building of the website and detailed research and writing were hard to do in just one semester. More content needs to be added to the website before visitors will get a true sense of the evolution of Virginia’s Jim Crow laws and black activism. However, I strove for quality over quantity and I feel that was more successful. My grant proposal indicated that I would try to bring visitors to my website by linking up with organizations that might display the site on their social media pages and Twitter feeds. Some of these might include the Library of Virginia and the Virginia Historical Society. Much more work needs to be done before the project is ready for wide distribution. But I’m hopeful that I can add more in the next year and eventually reach this goal.